Sandy has been camping in the Pryors for several years, spending weeks at a time with the horses. Abbie Branchflower will be joining Sandy for her fourth season as her assistant. Abbie has a vast knowledge of the horses as well. She will also be offering a photo book so you can make identification more easily once you are home. If you are interested in purchasing one of these, contact us and we will have it ready for you. The many stories that Sandy and her assistant share about the horses and the range, make this trip more than just a chance to view them, it makes this a trip more about knowing the horses, giving you a brief glance into the life of the Pryor Mountain Wild Horses. Experience living with the horses 24 hours a day and in doing so, this can give you a better understanding of what it is like to live wild on the range! These trips will be 4 days/3 nights on the mountain top. While on the mountain, we will be in Montana. This trip includes: transportation up and down the mountain, all food, snacks, tents, and expert personal guiding. (last night dinner is on your own once we return to Cody). There are many great hotels in Cody, you will be responsible for making your own arrangements before and after the trip. AirBnb is also a great source to find some lodging. I can pick you up at your hotel the morning of our first day, or you can meet me at my house in Cody. Camping trips will be limited to 4 guests. Sandy will have an assistant with her who will do the camp cooking and help you with any camping needs. Sandy will personally be doing all of the guiding. For reservations: Contact Sandy or click on the Paypal link to pay the deposit. My dream came true camping in the Pryor Mountains of Montana in July 2017. I have always felt a pull to our American West, horses and the Native American culture and history. Sandy Palen (Wild in the Pryors) was recommended to me when I was seeking out information on how I could spend time with our wild horses. I could not have asked for a more perfect opportunity and guide. I signed up for the July 15-18th , 2017 guided tour. How excited I was to be camping out in the beautiful Pryor Mountains with the gorgeous Pryor horses. I was picked up in Cody by Sandy and her assistant Abbie. I truly did not know what to expect and was kind of a chatterbox I think asking questions on our way to the mountain. Sandy was so patient and attentive answering all my questions. There is much to seen on the ride up and it goes by quickly. And when we got there…..the horses and open country were awaiting. I couldn’t believe they were right there! Finally, I was living a dream! Our campsite was in a fantastic location. We had horses walking by…..grazing nearby……and lots of wonderful viewing time just from the campsite. The meals were amazing and the smell of fresh coffee in the morning so very welcoming. Everything was planned and thought out to make this an experience of a lifetime….and one to remember so fondly. We would go out in the truck to search for some other bands and get different views. We took some great little hikes….to get different mountain views and search out other bands. The wildflowers were in bloom and some of the fields were just breathtaking. There are no words to describe the fabulous scenes that are etched forever in my mind and heart. Sandy made sure that you get the photographs you are looking for and will go out of her way to make sure you are content with everything. Her knowledge (as well as Abbie) of the horses and the mountain is just amazing. It was just awesome to listen to them name the horses, their background and everything about that. I truly envied them that. They truly do love their Pryor horses. We got to experience it all. From seeing a rainbow shining down on horses…..to seeing a one day old foal….gorgeous stallions standing on the hillside…..bachelors playing and strutting their stuff…..stallions protecting their mares…..gorgeous sunsets…..stormy skies…..unbelieveable views…and just experiencing what life is like in the day of our wild mustangs. For me to finally be out in the open….in the mountains….24/7 with the Pryor horses, I got to live one of my wildest dreams. It meant the world to me. I highly recommend Sandy (Wild in the Pryors) if you are looking for that once in a lifetime experience of spending time with our wild mustangs. You will not be disappointed. It’s just the best! If you are searching for an adventure, if you’d love to see and photograph some of the oldest descendants in the founding of America, if you love horses, nature and the out of doors, consider a trip with Sandy Palen and “Wild In The Pryors”. The road up to the mountain top is a bit rough, however, once you get up there it will take your breath away. Your first spotting of the horses will cause your heart to skip a beat. And it just gets better from there. Sandy knows these horses like the back of her hands. She knows the details of the stallions, their bands, their mares and their foals. She knows their history. She has a sense of where they will be in the mornings and where they might be in the afternoons. And she loves them! Along with being a great photographer, Sandy is an expert at camping and has everything so organized it makes camping easy. All someone has to do is show up. I had never camped nor slept in a tent and it was the most amazing thing. I wish I had that view from my tent every morning when I wake up. Sandy cooked delicious meals on top of that mountain; and a sandwich for lunch never tasted better than on that mountain. The views of the country side, the Bighorn Mountains and the Bighorn Canyon were unbelievable. You can see miles and miles of both Montana and Wyoming from up there. The horses in the Pryor Mountains are descendants of the horses brought over to America in the 1600s. They came with the original explorers who came to America. It is beyond words to be a part of these incredible animals and to be able to bring home memorable photographs of them. Advocating for and helping to save the mustangs running free becomes very real to you. I had attempted to make this trip for several years, however, was unable to. So when I was finally able to go this summer I left all my expectations at home. What I found up there was beyond my wildest dreams and more than anything I could have hoped for. We saw a foal only a few hours after she was born. We had almost every horse on the mountain walk or run by our camp sight two evenings in a row. I had the privilege of seeing the oldest horse on the mountain, a mare, still loving her band. Photographing the horses against the sunset two nights in a row is still a vision in my memory. I hope some day to return and hope these horses are still running free. If you love horses and you are looking for the trip of a lifetime which includes them, you have found it! Has a Missing Horse Reappeared? A couple of weeks ago, there were some photos posted on the Pryor Mountain Mustang Center’s Facebook page. These photos, were taken by Dennis McCollough. It showed three dark-colored horses, two of which were easily identified as Orlando and Oglala. The third was not as easily identified. 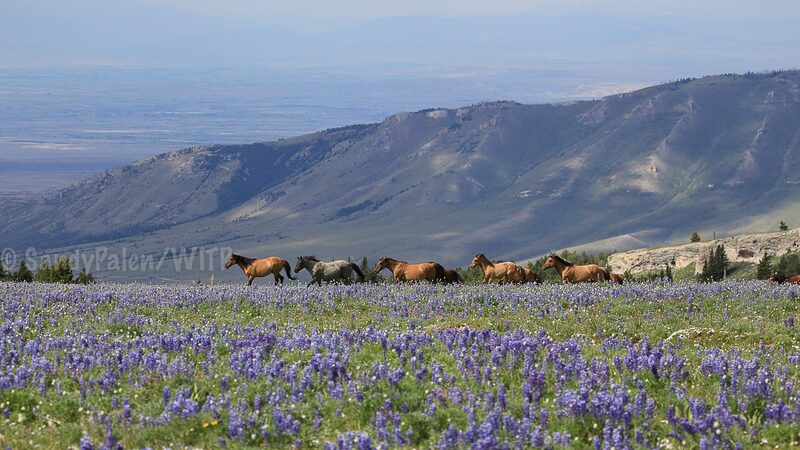 Another wild horse follower, Dawn Ness, was also in that area and took some photos. 1. Seattle, the son of Tacoma and Three Bars, was born in 1997. He was reported to look very thin this past fall and also has a very distinct swollen knee on the right side. This horse was not him. Seattle, photo taken by Laura Curtis. 2. Chief Joseph, son of Bakken and Seattle, born in 2009. Without spotting his back right hind, he could easily be thought to be his full brother Issaquah. But this horse had no right back hind, (as seen in Dawn’s photos below). 3. Inniq, son of Sitting Bull and Ceceila, born in 2008. Several people thought and think it was Inniq. But Inniq has a very destinctive star, and this horse does not have one. (Thank you Dawn for taking that photo of this horse with a clear shot of his forehead with out a star! Not Inniq! Photo taken by Dawn Ness. The first person to make the comment that it was Issaquah, was Alex Pitterman. Alex has followed this herd for many years and is virtually a walking encyclopedia with what he knows about this herd. At first I thought maybe it was not Issaquah, but then I began to think about the vastness of the Dryhead and how he could easily be misidentified for one of the other black horses. I am convienced that the horse that was spotted is indeed Issaquah. Thank you Alex for bringing it to our attention! As a young bachelor, Issaquah was almost always seen with his 1/2 brother Hawk (they share the same sire). In fact I would call them HawkandIssaquah, because they were rarely apart. But when Hawk gained his own band, Issaquah was not allowed to join him and so this most likely started the mix up of his identity and the assumption that he was no longer with us. Issaquah may also have decided to go off on his own and was not as visable. I saw him once along Burnt Timber Road, about 3 miles from the bottom, by himself in August of 2014, and I am betting that once others start to think about their sightings of black horses over the last few years, especially at a distance, we may all realize that Issaquah was there all along. Whatever the case, I am convienced that the horse that was spotted in late February is indeed Issaquah. And with all of the death and disappearances of the many horses over the last few years, this news of yet another survivor is very welcome. It’s great to see you Issaquah! Who Will Have Foals in 2017? Most of Jasper’s Band, July 2015, right to left: Jasper, Okiotak, Milicent, Ketchikan and Oklahoma, (Lariat is out of the frame). We must be careful with this special herd, in 2016, there were 10 deaths, and 11 births, leaving only a population increase of 1 horses. You can click on the post I did in October 2016, ( The Horses that have Passed) if you would like to learn more about that. Since I wrote that post, the death of Quivira (Moenkopi foal) increased the deaths to 10. Keeping a close watch on the population gain and adjusting the PZP accordingly, will make this herd healthy and viable to carry on into the future. We must carefully watch which mares are vaccinated and what horses are removed and make sure that we keep an equal balance of representation for all of the horses on the range, regardless of color, or favorites. I anticipate that 2017 will be a low birth year. Below are the mares who may foal. Halo, 2007 daughter of Waif and Corona, currently in Fools Crow band. 2. Jewel, 2009 daughter of Waif and Corona, currently in Fools Crow band. 2. Kitalpha, 2010 daughter of Buffalo Girl and Durango, currently on her own, with her two daughters, but was with Hickok. Hataali, 2007 daughter of Sapo and Shaman, currently in Morning Star’s Band. 2. Hailstorm, 2007 daughter of Aztec and Cloud, currently in Morning Star’s band. She has never foaled. 3. Hera, 2007 daughter of Audubon and Morning Star, currently in Galaxy’s band. 4. Heritage, 2007 daughter of Warbonnet and Lakota. Her only living offspring was removed in 2012, she has not foaled since. She is currently in Doc’s band. 5. Isadora, 2008 daughter of Rosarita and Starman, she has not foaled since 2011. (the foal is deceased). She is currently in Morning Star’s band. Isadora with her 2001 foal and her mother Rosarita. 6. Jacinta, 2009 daughter of Rosebud and most likely Tecumseh, she is currently in Garay’s band. 7. Jasmine, 2009 daughter of Aztec and Cloud, has never foaled, currently in Doc’s band, but moves around frequently. 8. Juniper, 2009 daughter of Sapo and Bolder, currently in Horizon’s band. She has never foaled. 9. Ketchikan, 2010 daughter of Gold Rush and Two Boots, currently in Jasper’s band. 10. Kohl, 2010 daughter of Quelle Colour and Lakota, she is currently in Garay’s band. As with every year, I will keep you posted on the new births as soon as I learn about them.